For suspension testing of vehicles the PEGASEM MMS Mounting System is now available in combination with a wire displacement sensor. This sensor can be fitted to a vehicle‘s wheel hub and fender within a few minutes. Suction cups or rubber coated mag-nets allow the MMS System to be quickly and easily attached to a vehicle without damaging any paint. The waterproof sensors are especially designed for use in harsh environ-ments. 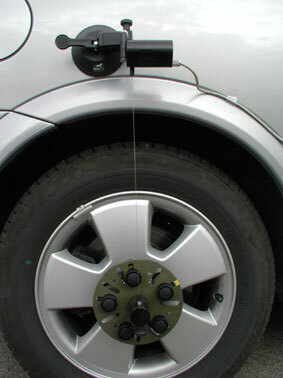 The versatility of the MMS System allows the sensor to be fitted to most vehicles. Different wire lengths and measuring ranges are also available for various vehicles. Please contact the factory for a quotation tailored to your specific application.